A beautiful bluebird weekend heralded a promising start to Season XXVII as Beach Polo, Sponsored by The Hermitage Club ushered in a new year on Feb. 17 & 18. 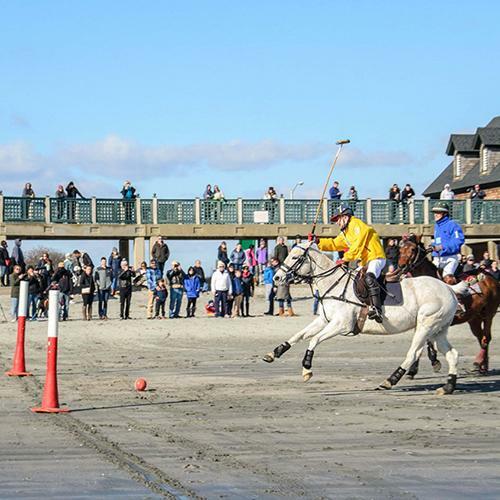 The exciting two-day exhibition marked the opening weekend of the 30th annual Newport Winter Festival with over a thousand spectators each day to witness the action on Newport’s Easton’s Beach. Fans lined the playing area, and watched on-high for a bird’s eye view from The Chanler at Cliff Walk, site of the official afterparty. We are pleased to introduce you to our newest sponsor, The Hermitage Club. Like Newport Polo, The Hermitage Club endeavors to enhance New England living by creating a safe, family-friendly resort that offers prime conditions for people who love to ski and enjoy winter activities within the region. It’s also much more than a winter sports haven. With an 18-hole championship golf course, all-season mountain activities, gourmet dining, its a year-round outdoor destination for connecting with family and friends. The Hermitage Club invites you to explore everything they have to offer with this special invitation. Day 1: The Blue Team with captain Dan Keating (#3), Clark Curtis (#2), and two players from the Newport Interscholastic Girl’s Polo Team (#1), challenged the Gold Team of captain Sam Clemens (#3), Amy Rice (#2), and Peter Jenkins (#1). Gold drew first blood with two goals by Jenkins and one by Clemens that set the tone for the match. Keating kept Blue in the running to end the chukker 3-1. Clemens came out on his favorite horse for the second chukker and immediately went to work, scoring four goals. Curtis and Keating turned up the heat with a goal each to trail Gold 7-3. A half-time strategy meeting paid off as Blue took control of the third chukker. Keating and Curtis doubled Blue’s score, while strong defense limited Gold’s advance to an 8-6 lead. With one chukker remaining Keating made an early move to close within one point of Gold. Clemens and Rice padded Gold’s advantage as the clock ran down, ending in a 10-7 Gold win. Day 2: Riding in on its Saturday victory, the Gold Team trotted onto the field to face the Blue Team, with pitch hitter Brian McCormick standing in for the interscholastic players. Once again, Gold led the charge, 2-0 thanks to goals by Clemens and Rice. Keating renewed his determination, unleashing a torrent in the second chukker, briefly overtaking until two goals by Gold maintained its 4-2 margin. Blue continued to advance in the third chukker, with goals by Keating and Curtis flanking a goal by Clemens to solidify its advantage over Gold, 6-5. Cracks in Gold’s armor appeared in the final chukker, unable to break through the Blue’s defense, while Blue strengthened its position, for a comeback 8-5 victory. The beautiful spring-like weather brought out a thousand or more fans to watch the first polo match of 2018 unfold in Newport. Scenes of children playing on the pitch, dogs socializing, and friends enjoying an afternoon of polo painted a picture seen on summer afternoons at the Newport International Polo Series. After the match, fans and players toasted the start of the year on The Chanler's Cliff Walk Terrace. View the photo album on our Facebook Fan Page. The 27th season of the Newport International Polo Series opens on Saturday, June 2nd with the debut of Poland. Tickets are on sale March 15th to witness 18 weeks of intense polo competition, with 8 international teams, 6 of the home team’s toughest U.S. rivals, the 18th annual International Polo Charity Ball, Midnight in Marrakesh, and colorful Après Polo events. There is no sport like polo. Be a part of it! Newport Polo hosts the Newport International Polo Series XXVII, and is the home of America's first polo club, est. in 1876, and a founding member of the United States Polo Association, offering public exhibition matches, polo club member services for grass & arena polo, and polo instruction year-round. Information about Newport Polo's events, polo lessons, membership, and sponsorship can be found in About Newport Polo.